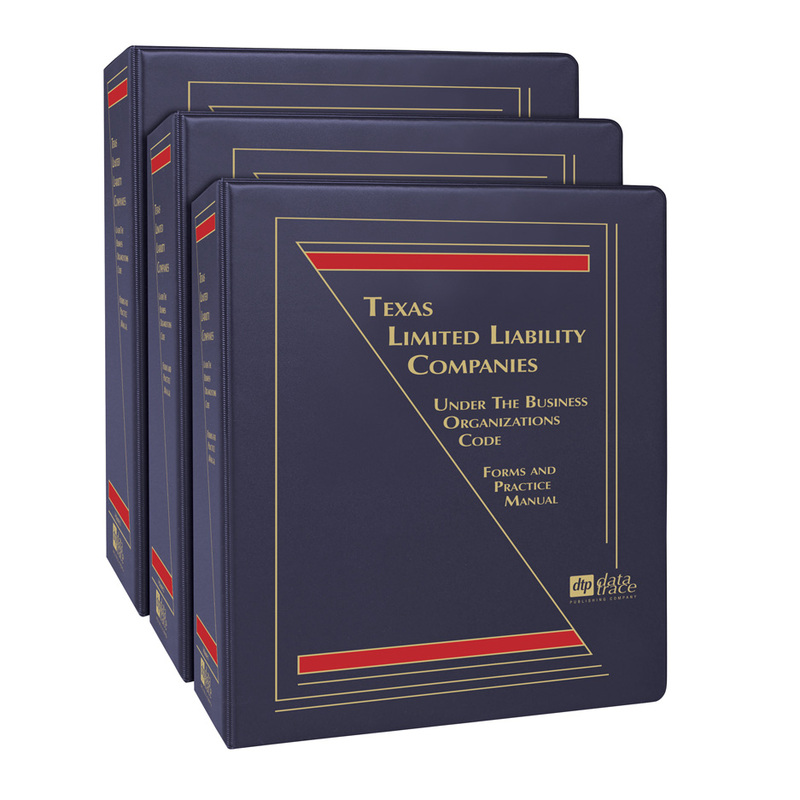 Prominent Texas attorneys have drawn from their extensive experience and collaborated to bring you strategies and forms for virtually every situation you may encounter in this newly revised three-volume Manual featuring a bonus CD with more than 180 electronic forms. 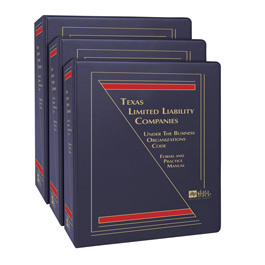 This extensive, updated manual, with its more than 1,960 pages of valuable content, will help you stay current and efficient by providing appropriate statutes and regulations — complemented by thorough discussions and analyses of any changing federal and Texas state laws. Plus, you'll be expertly guided through an extensive selection of appropriate LLC forms using an easy-to-follow format. Included are customizable electronic forms as well as explanations and planning strategies for the LLC business structure. Further Revised Chapter 10 – Books, Records, and Accounting – to take into account the new partnership examination regime enacted by the Bipartisan Budget Act of 2015 and the regulation promulgated thereunder. A new Chapter 19 providing an in-depth review of Section 199A enacted by the popularly titled Tax Cuts and Jobs Act of 2017. A new Appendix containing examples on the proposed regulations. Significant revisions to Appendices A through D.
William P. Bowers, Esq., is a shareholder in the Dallas office of law firm Fulbright & Jaworski L.L.P., where he specializes in federal income tax. Mr. Bowers is also an adjunct professor in the University of Texas School of Law and in the Masters of Tax Program at Georgetown University School of Law. He received his B.B.A. in Accounting from Texas A&M University; his J.D. from Southern Methodist University; and his LL.M. in Taxation from Georgetown University Law Center. George W. Coleman, Esq., is of counsel to Bell, Nunnally & Martin LLP. Mr. Coleman has extensive experience in structuring and negotiating complex business transactions and in negotiating complex partnership and LLC structures, including handling the acquisition and disposition of businesses, the financing of business activities, the creation of business entities, family succession planning, and assisting committees of boards of directors. He received his B.S. in Petroleum Engineering from the University of Oklahoma and his LL.B. from Southern Methodist University. Patrick L. O'Daniel, Esq., is a partner in the Austin office of law firm Fulbright & Jaworski, L.L.P., where he specializes in federal income tax. Mr. O'Daniel advises on a variety of international and domestic issues concerning the formation, operation, acquisition, merger, combination, liquidation and disposition of partnerships, limited liability companies, and corporations. He received his B.B.A. in Accounting from the University of Texas (with highest honors) and his J.D. from the University of Texas School of Law (with high honors). R. Barrett Richards, Esq., is a member in the law firm of Frost Brown Todd LLC, Dallas, Texas, where he focuses his practice on the tax, business, operational, and regulatory aspects of doing business for clients of all sizes, succession planning, estate planning, and the particular challenges of doing business faced by health care entities. Mr. Richards received a B.A. from Baylor University in 1972, a J.D. from Baylor University Law School in 1973, where he was a member of the Baylor Law Review, and an LL.M. in taxation from Southern Methodist University Law School in 1974. Mr. Richards is board certified in Tax Law, Estate Planning & Probate Law, and Health Law by the Texas Board of Legal Specialization. He is admitted to practice before the U.S. District Court for the Northern District of Texas, the U.S. Tax Court, and the U.S. Department of the Treasury. His current memberships include the Sections of Taxation, the Estate Planning and Probate Sections, the Health Law Sections, and the Business Law Sections of the State Bar of Texas, the American Bar Association, and the Dallas Bar Association. He is a member of the Limited Liability Company, Partnership, and Unincorporated Entity Committee of the Business Law Section of the American Bar Association, is past chair of the Health Law Section of the Dallas Bar Association, and is a Life Fellow of the Texas Bar Foundation. He has written and lectured extensively on taxation, estate planning, and health law topics. He was a founding member of, and continues as a board member on, the advisory board for the Health Care MBA program at Hankamer School of Business at Baylor University.